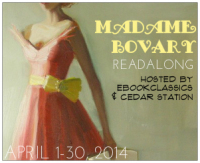 The Madame Bovary read-along is hosted by Juliana @ Cedar Sation and C.J. @ ebookclassics. On April 10, I posted my thoughts on Part 1 of the book. Today is Part 2, and Part 3 will be posted on April 30. At the beginning of Part 2, Emma and Charles have arrived in their new town, which they moved to in the hopes of alleviating Emma’s depression, and a baby is on the way. They were greeted enthusiastically by their neighbours, M. and Mme. Homais, who run the pharmacy. Also, on that first night, they had the pleasure of meeting a young man named Leon, who joined them for dinner. He and Emma fell into easy conversation with each other, and continued to look forward to each other’s company. Emma had a baby girl, and this is, no matter how hard I try to like Emma, where I decide that I just can’t. She sends her baby to a nurse, and we don’t see or hear much of her again. The nurse doesn’t even stay at their house, and maybe that was normal then, but I cannot imagine it. She just does not seem to care about her baby. I can say this for her, though; knowing the limits for girls in society, for the sake of her child, she badly wanted to have a boy. The thought of having a male child afforded her a kind of anticipatory revenge for all her past helplessness. A man, at any rate, is free. He can explore the passions and the continents, can surmount obstacles, reach out to the most distant joys. Whereas a woman is constantly thwarted. At once inert and pliant, she has to contend with both physical weakness and legal subordination. Her will is like the veil on her bonnet, fastened by a single string and quivering at every breeze that blows. Always there is a desire that impels and a convention that restrains. What compelled Flaubert, as a man, to write about all this? And, why did the creation of a character who felt trapped by the views and laws of her time, also have to be made to feel indifferent towards her own child? Could he still have gotten his message across with a more likable protagonist? Didn’t he think that a woman could long to be free, and still be both likable and maternal? Emma and Leon continued to be friends and to see a lot of each other, both longing for more. Luckily, Charles “was not of a jealous nature, and saw nothing odd in it”. When Leon moved away from the village, Emma fell into despair. Then the appetites of the flesh, the craving for money, the melancholy of passion, all blended together in one general misery. Instead of turning her thoughts away, she riveted them to it the more firmly; she worked up her grief and sought out its occasions. To make it harder, Charles had apparently no notion of what she suffered. His unquestioning belief that he made her happy seemed to her a stupid insult; his complacency on the point, ingratitude. For whose sake, then, this goodness of hers? She would have liked Charles to hit her, that she might have just cause for hatred and revenge. She was surprised sometimes by the hideousness of the ideas that occurred to her. And all the while she must go on smiling, hearing herself insist that she was very happy , pretending to be so, acting the part. I can see this post going on too long, at this rate, so I will try to quickly sum up the rest. Soon, after Leon left, Emma met Rodolphe, and Leon quickly became a distant memory. Unlike Leon, who seemed sincerely attached to Emma, Rodolphe just wanted to see if he could seduce her, and he was very successful. Their affair went on for a while, with Emma getting very attached and less careful about keeping it a secret. She tells Rodolphe she wants to go away with him,and Rodolphe agrees, but then backs out of it and goes on his own, leaving behind a letter for a very lovesick and heartbroken Emma. Emma plunges so deep into despair this time that she becomes very ill, and Charles fears for her life. But, in time, she comes out of it. For a while, she devotes herself to God and charity work. She has “chosen the path of resignation”. Even her mother-in-law can find no fault with her. Poor Emma’s course changes again when Charles takes her to town to see an opera, and they run into Leon there. It has been three years since he left their village, but as soon as she sees him, all the love and memories flood back, and she does not even care to finish watching the opera. Charles insists she stay on in town, without him, to see the play again the next day. So, of course, she does, and that is where Part 2 ends. It seems common in classics that people become very ill when they are upset or heartbroken. I am assuming they don’t know much about depression yet, but why do the characters often get so physically ill? For example, what is Brain-fever (p.221)? I agree. If Emma was more maternal, it would probably be a very different book, and likely not as entertaining. She is definitely a drama queen. Do you think she exaggerates her condition, or do you think she is just plain unstable? I can’t make up my mind on this. I think of Emma as mentally unstable, but I think that’s because I am reading this book in the 21st century. I am the first to admit that I don’t know much about Flaubert, but I read that he wrote this novel to criticize romanticism and the pretentious middle class, in which case it would work better to see Emma as someone who exaggerates her condition. I am curious to see if Part III will help me make up my mind. I’m behind on my reading, so I just read half of your post, stopping at the point where I’m at in the book. But I found this question quite intriguing: “Didn’t he think that a woman could long to be free, and still be both likable and maternal?” with the key words in your question being “long to be free” (not “be free”). I think that so many of us are that woman – we’ve devoted our lives to our children and yet a huge part of us have longed for freedom. Many mothers do not act on that desire to be free and those who do do get viewed as selfish. You’re right that someone like Emma makes for a juicier, less typical story. LOL, yes, what exactly is brain fever? If it is real then I suffer from it ALL the time! Your discussion about motherhood and freedom makes me think about the never-ending working mom guilt or stay-at-home-mom vs. working mom discussions that are always in the media. I think all moms wrestle with the freedom issue and none of our decisions come easy. While I think Emma has the right as a woman and a human being to long for her freedom, I feel she loses our respect because she won’t acknowledge her responsibility as a mother, constantly puts herself first instead of her family and is terrible moral role model for her daughter. As I think Cecilia mentioned on my blog, Emma is unable to make any of the sacrifices we expect from her as a mother. Yes, that is definitely the reason I don’t like her. Thanks you for putting it so nicely into words for me. I can handle a lot of faults in a person, but consistent lack of interest in your child or in thinking of others before yourself (like we all have to do) is a deal-breaker. I think they get physically ill for more drama. That,s what I suspect, too. I have the same question about physical illness – it comes up in Wuthering Heights, in particular, but all sorts of Victorian lit. Was this a Real Thing or is this just how women were portrayed, as weak and unable to deal with reality? I think the “nursing out” thing *was* normal (from what I’m reading in other books) and I imagine not living with your baby would make it hard to form a normal attachment. I don’t hate Emma, I see her as a product of her times in a lot of ways, but I did feel some delicious schadenfreude when she got dumped! I still like to think that many women, who had the means to, refused to send their babies out to nurse, but maybe it was shocking if you didn’t. As much as I don’t like Emma, I also can’t hate her. I feel too bad for her to hate her. It must not be very fun to go through life feeling so miserable and desperate all the time.